When a big storm hits, there are so many things to do to prepare for it; things to prepare before the storm hits, and of course what needs to be done after the storm. Whether you working on storm cleanup efforts after a blizzard in the winter, or flooding and wind damage after a hurricane or tropical storm, a broom and rake are not going to be your only essential tools. Your cleanup efforts may include water/flood damage, glass, wind damage and even mold. Here are a few tips that can help you prepare, and take a few extra steps after the storm to get you back on track. 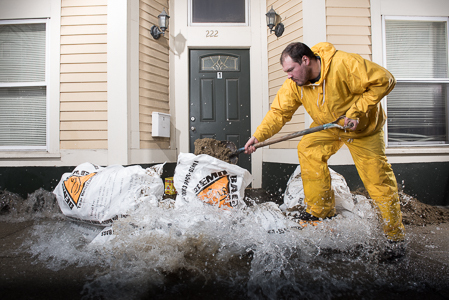 Demobags water and tear resistant Bags are perfect for storm cleanup efforts. Learn more and order today! Big storms, such as a hurricane or tropical storm, bring floods. You need to be very specific in your approach to cleaning it up, and of course staying safe. For instance, you will want to shut off the electricity, however you only want to do this if the water has NOT reached as high as the electrical outlets in the room where your main breaker is. Chances are if you have, you may have a larger and more dangerous electrical issue on hand. Know what needs to be turned off, and more importantly, where all the shut off switches are. The gang at This Old House have some great tips on how to clean up flooding, whether it is a huge storm, or a broken appliance. One issue with storm cleanup efforts, especially any flooding or water damage situations is mold. Mold will grow in damp areas, so drying up and proper mold preparation is essential in stopping the growth of mold as quickly as possible. Make sure you have all the essential tools, and of course, know when it is something you can handle, or when it is time to consider calling a professional. DoItYourself.com has put together a great list of things to consider for mold cleanup after water damage. Potentially one of the hardest and dangerous aspects of storm cleanup can be tree repairs or removal. First thing to do is to assess the situation and to see what damage has been done already, and what potential issues may be ahead for the tree and your property. You may be able to trim the tree, or partially cut the tree in certain areas to save the tree and keep it stable, or you may have to completely remove the tree. Most important tip: don’t work on tree cleanup and removal on your own. Small cleanups and cuts are ok, but removal must be dealt with carefully and safely for the sake of your property and yourself. The most common clean up efforts in any storm is the messy cleanups like leaves, small debris from around the house and even cleaning and repairing any glass that may have been damaged during the storm. Be sure that you are using proper tools, such as Demobags, contractor woven bags that are tear-resistant, water-resistant and able to hold from 90-450 lbs of weight depending on the bag. Also, make sure that all your storm clean up tools are working properly, such as blowers, saws, drills, etc. Find a Demobags Retailer Near You Today!